After the introduction of the Infiniti G35 Sedan in early 2002, a stylish coupe joined the G35 lineup in November 2002. The Infiniti G35 Sport Coupe is basically a four-seat version of Nissan's great 350Z sportscar. Both share Nissan's FM (front mid-ship) rear-wheel-drive platform, which places the 3.5-liter V6 engine behind the front axle and positions the wheels out near the vehicle's corners for a better weight distribution and stable handling. 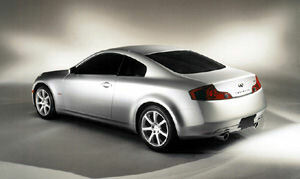 As a result, the Infiniti G35 Sport Coupe also inherits the agile responses of the Nissan 350Z. The Infiniti G35 Sport Coupe comes powered by a 3.5-liter V6 engine that produces 280 hp, an increase of 20 hp over the sedan. In addition to the automatic transmission that was initially the only choice on the G35 Sedan, the G35 Sport Coupe also introduces a 6-speed manual that's actually the better choice among the two transmissions. Infiniti G35 models with the automatic are available with cloth and leather seat-upholstery. Manual versions come fully equipped and also get high-performance Brembo brakes. The Infiniti G35 Sport Coupe's exterior styling is both sporty and elegant. The G35 Sport Coupe shares the sedan's 112.2-inch wheelbase, but is several inches shorter and lower. With its performance-oriented chassis, wider wheel openings and fenders, the G35 Sport Coupe is slightly wider than the G35 Sedan, though. Just like the sedan, its aggressive and sporty silhouette make the Infiniti G35 Sport Coupe stand out from the crowd. The frontal appearance is dominated by distinctive, vertically oriented headlights with integrated fog-lights and turn-signals, and the characteristic Infiniti-grille. The low-slung hood blends smoothly into the sharply angled windshield to form a fluid side-line from the front fenders to the rear. The short rear deck ends in a crisp crease, concealing the biggest trunk in the class. L-shaped taillamps suggest BMW performance and use a cluster of bright LEDs for bright visual recognition during braking. The optional rear-wing is aero-dynamically helpful, though optically more of a disturbance.